“When you boil it down to its essence, Flogging Molly is all about playing music that is very real and organic, and playing it with all the piss and vinegar and passion you can in each note,” says guitarist Dennis Casey. While the seven-piece Irish-punk powerhouse might have grown out of their early days of singing about pirates, the Sacred Heart and the devil’s dance floor, their defiant, hopeful core message has never been more relevant. And even after more than 15 years of making music, they haven’t lost any of their swagger. The Flogging Molly family came together in 1997, in a Los Angeles bar called Molly Malone’s. Dublin-born vocalist Dave King formed the band with violinist Bridget Regan, and Casey, Matt Hensley (accordion), Nathen Maxwell (bass), Bob Schmidt (mandolin, banjo) and George Schwindt (drums) rounded out the lineup. The traditional music of King’s childhood found a rebellious voice in tribal, fiery punk rock, with subject matter that includes the Roman Catholic Church and King growing up in Ireland. But far from appealing only to a niche demographic of listeners, on a larger scale, Flogging Molly’s music is about love, loss and hope for a better day, a battle cry for downtrodden people everywhere. 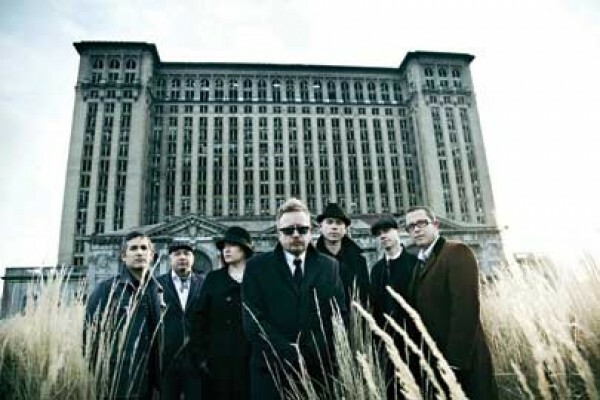 More recently (and more locally), Flogging Molly has become a champion of the American working class, particularly the struggling city of Detroit, as heard on their latest studio album, Speed of Darkness (2011). The album was the debut release on the band’s own record label, Borstal Beat, and was written in the basement of the Detroit home that King and Detroit native Regan bought together after marrying while on tour in support of Float (2008). Songs such as the bluesy “The Power’s Out” and “Don’t Shut ’Em Down” tell the story of “the devastation: foreclosures, people being thrown out of their homes, factories closing, people living on the streets … and so on,” Casey says.